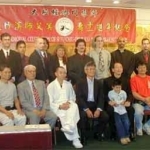 The famous fighting master and founder of the Northern Praying Mantis system, Wong Long, had four disciples during the Ch’ing dynasty, each claiming superior innovations and each seeking to be released from the founding school. The master said their desires would be granted on one condition, that each disciple name his system after markings on the back of personally captured mantis. One had the appearance of the Yin-yang symbol (Tai Ji), another looked like a Plum blossom (Mei Hua) one with the marking of 7 stars (Qi Xing), and one with no marks at all called the Bare Back (Kwing P’an). 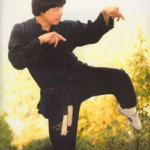 The Tai Mantis practitioner delivers most of his strikes with great internal power, using a penetrating strike rather than sub-surface impact. Power generates from the ground to the waist to the technique. Parries are used more often than blocks, including one unique defensive technique called the “trading off” theory. 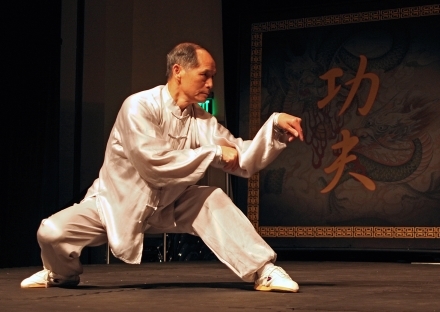 Here, the practitioner will slightly deflect an opponent’s technique by quickly twisting his or her body to the side, or he or she may even allow the technique to connect. In return, he or she is situated very close to his or her opponent and can strike back with a much more powerful blow, usually dead center to the opponent. 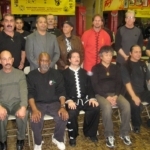 Due to the emphasis on these parries and close proximity fighting, considerable effort is made to toughen the arms, legs, and body by hitting hard objects, and by two-man contact sparring. 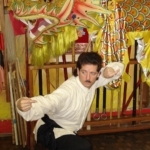 Indeed, it has been said, “If you spar with a Tai Chi Mantis, every time you hit him, you’re helping him train.” Most of its techniques are both practical and powerful. They often require balanced and alternating execution of hard and soft powers. Movements are rich in animal forms imitation of the mantis. 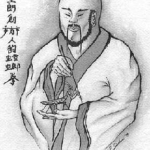 Highly useful offensive and defensive techniques are based on such Shaolin Kung Fu fighting concepts.